The purpose of the EcoVeg classification approach is to describe the diversity of terrestrial ecosystems across the globe and inform decisions about conservation and resource management. The approach provides the scientific basis for the U.S. National Vegetation Classification, Canadian National Vegetation Classification and NatureServe’s International Vegetation Classification, and has encouraged international and national collaborations elsewhere in the Americas. The approach is global, but most advanced in the western hemisphere, especially the U.S. and Canada. EcoVeg provides a consistent thematic framework to support extensive vegetation mapping across the U.S. and Latin America. The approach provides an 8-level hierarchy for natural types, with three upper (formation) levels, three mid (physiognomic-biogeographic-floristic) levels and 2 lower (floristic) levels, and a separate 8-level hierarchy for cultural types. Types are maintained through a review board to ensure consistent definition. All protocols use the best available scientific information, including plot data and secondary sources. Preferred plot sizes typically range from 0.01 to 0.1 ha (to 1.0 ha in tropical vegetation). Plot data include full species lists by strata with cover values, and supporting environmental and site data. The classification approach meets the need for a dynamic, 8- level catalog of types for all existing vegetation. The open, peer-review model allows for ongoing improvement by ecologists, while always providing comprehensive versions for users. Use of the best available scientific information ensures that the legacy of previous classification efforts is fully incorporated. Limitations include somewhat complicated names for types, limited availability of comprehensive plot data sets, and sparse testing beyond the Americas and Africa. The conservation or at-risk status of macrogroups, groups and associations are evaluated using both the IUCN Red List of Ecosystems and NatureServe Conservation Status Assessment protocols. Faber-Langendoen, D., K. Baldwin, R.K. Peet, D. Meidinger, E. Muldavin, T. Keeler-Wolf, J. Carmen. 2018. 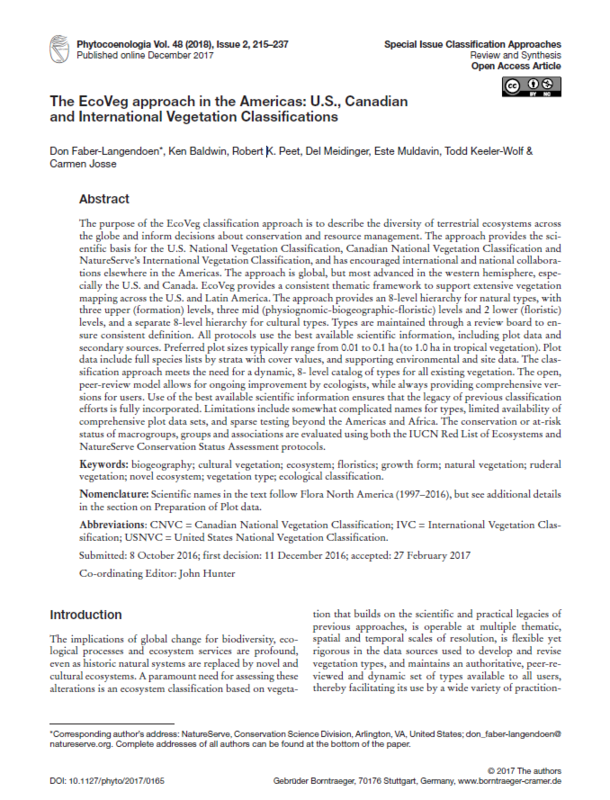 The EcoVeg approach in the Americas: U.S., Canadian and International Vegetation Classifications. Phytocoenologia, Band 46 Heft 2, p. 215 - 237. DOI: 10.1127/phyto/2017/0165.